Audio-Visual Equipment Rentals by WarPro. Call 0131 558 3824 during office hours or email info@warpro.co.uk for assistance. If you want to hire a projector in Edinburgh then you have come to the right place. Edinburgh Projector Hire group have an extensive stock of video projectors & data projector available for rent in Edinburgh for use with a wide variety of applications such as projection of powerpoint boardroom presentations using a laptop, or film projection from a DVD source. Our projectors can be connected to standard DVD or Blu-ray playback decks, media players and computers, all of which we also have in our hire stock. If you require any further projection equipment accessories such as a tripod screen, fast fold screen or cables to connect your video / data playback device to the data projector we can supply you. Our basic hire stock is currently made up of XGA models such as the Panasonic LCD XGA resolution projector model PT-VX420 which has a light output / brightness factor of 4500 lumens, with a great quality image to boot. This is easily bright enough to use in a lights-on presentation situation for up to 30 people. As this is an XGA projector, its native resolution (screen size, essentially) is 1080 pixels by 768 pixels, which is the larger of the two most common 4x3 computer screen sizes. Weighing in at 3.3 kilos, with a compact size of of 35 cm x 10 cm x 30 cm, and a handy carry bag these are a great piece of kit. 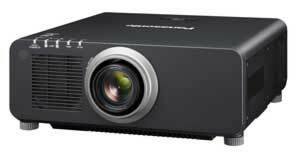 Our standard daily hire charge for these projectors is £95 per day plus VAT. We stock a range of higher resolution portable units, mainly HD and WXGA resolution which include the Optoma EH415 (1920 x 1080 pixels, 4500 lumens) and the Panasonic PT-VW340 (1280 x 800 pixels, 4200 lumens ). These units are great for any widescreen application in business use, galleries or even domestic situations. 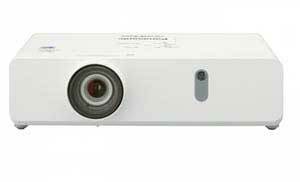 Our standard daily hire charge for these projectors is £95 per day plus VAT. 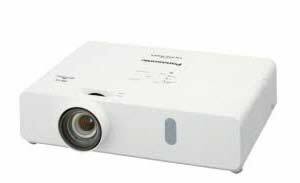 If a larger projector is required, we have a full range of Panasonic projectors for hire in Edinburgh, with various models capable of outputting brightness in the 7000 - 31000 lumens range. These are slightly larger, bulkier & heavier install grade data projectors for hire in Edinburgh and will happily operate from a variety of input sources such as PAL / NTSC / Composite Video / Data / etc. These are very bright & can offer very high resolutions, with a pixel screen size of up to 1920 x 1200 (WUXGA). These units vary in weight & size depending upon the model, but would usually be supplied with appropriate connectors and accessories required for operation. Daily hire rate for these projectors varies depending upon the model. See our hire stock pages for details. These projectors can be mounted in a variety of positions, for instance, ceiling mounted (with specialist brackets) or standing on a simple table. We can offer advice as to how best to rig your projector for your application. In addition to hire services, EPH aka WarPro offer a range of ancillary services including sales and installations, digital signage hire and projected advertising. Follow the read more link below for more information on large scale projection options that we can offer as dry or serviced hire. We regularly rent and sell equipment into theatre and live music, drawing on our background in touring events. Click the read more link below for examples and photographs of projected advertising outdoors on buildings. We work across the UK. Our hire stock includes everything from basic powerpoint presentation projectors right up to large event projectors suitable for the biggest audiences. DLP, LCD and LCOS options available. We have Panasonic Triple-Chip DLP, Single-Chip DLP, E-Series and System Lenses, plus Sanyo XF/HF & XP lenses which have equivalence with many Eiki, Christie, Canon and other manufacturers models. We have tripod, pull-down, pull-up, Draper UFS and truss-framed screens in various sizes and aspect ratios. Many rear-projection surfaces are available. Our kit includes switchers, scalers, distribution amps, matrix switchers, video wall controllers, mini-convertors and lots more.